This entry was posted in Attractions, Family Vacations, Insider Tips and tagged attractions, christmas, christmas tree, legoland, San Diego holidays, seaworld, snow by Aki. Bookmark the permalink. Sounds good for a hard working family of 5!!! !I WISH. Great article, We are visiting SD next week from 11/21 to 11/23. Coming from TX my kids would love both Legoland and Snow world. Thanks! I have lived in San Diego all my life and have yet to visit Legoland!! I have never been to LEGOLAND. I would love to go! Whoo Hoo! Just how I like my snow here in San Diego… Artificially created! We’ve never been to LEGOLAND but I know my 5 and 3 year old would absolutely LOVE it! My husband, who is a firefighter, is graduating from a very long, grueling paramedic program and this would be the perfect way to celebrate and finally get to spend time with him! PLEASE pick us!!! Congratulations Kristi! You’ve won four (4) SEALIFE Hopper Passes! Have a happy holidays! I too come from New York City and have lived in BEAUTIFUL SAN DIEGO for the last 24 years and I wouldn’t leave for nothing in the World!! It’s just beautiful here anywhere you go and the people are just friendly!!! I would love to return to Legoland and I adore the Sea Life Experience! Haven’t been to LEGOLAND during our previous trips to SD. Daughter is LEGO-obsessed right now. Would love a reason to book a trip to San Diego! My little man has is LEGO shirt on today for some playtime with friends! Would love to win the family 4 pack for him and his sister- What a great way for us to spend our Family Day’s! not sure who would be more excited.. me or my kiddos?? Would love to be a part of this!! Oh how I miss the snow around Christmas:( So beautiful on Christmas Eve…making snowmen, snow angels, snowball fights, building snow forts, ice skating…the list is endless. Love reading your blog I just moved to San Diego so it’s great to know what going, and where to go! Thank you so much! My family is coming to visit from Ireland and I would love to surprise them with tickets to Legoland! My little girl and I would just love these. She has been trying really hard on her potty training and this would be such a great reward!! Thank you… Happy Holidays! What an awesome giveaway! I live in Ramona, so last year my kids were able to play in some snow at my mom’s house and they’ve been asking since when it’s going to snow again! I’ve yet to be able to take them to legoland so a trip there WITH snow would be such an awesome gift to them! I would be thrilled to surprise my family with this awesome gift under our Christmas tree! I REALLY WOULD LIKE TO WIN BECAUSE MY 2 NEPHEWS HAVE NEVER SEEN SNOW OR LEGOLAND BECAUSE OF MY DAD BEING IN THE HOSPITAL. My girls love the snow and have never been to legoland, it would be a memorable time. Great post! Thanks for giving us a chance to win the tickets! 🙂 Our family of 4 (kids 8yo and 3yo) love both Legoland and Seaworld, we go there at least once a year! I would like to take my kids! My family would love this vacation! My husband has been out of work since October 2010 and things have been a bit leaner. I’d love to take my kids to Legoland. We’ve been once and they loved it! We are currently enjoying SnowWorld at SeaWorld. This is great! I love Seaworld and Legoland and glad there is somewhere local I can take my kids to see snow! I took my kid to Sea World and she is begging me to take her to Legoland as well. We would be ever so greatful this holiday season if we were picked the winners, it would make our year! 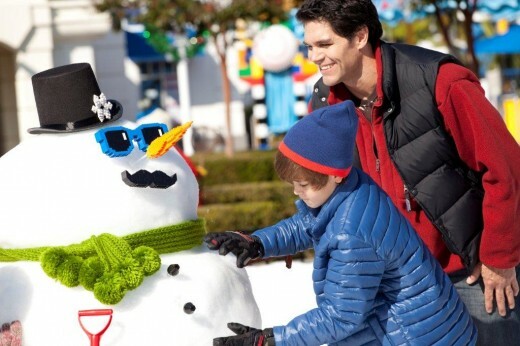 My “Daygo babies” will be happy to see some snow… especially at LEGOLAND! Snowy fun in the sun :)…sign me up! Snow in San Diego sounds like great like peanut butter and jelly. The kids would love the chance to go to Legoland! We’re escaping the harsh Canadian winter to come to California in February. These passes would make our trip even better. Thanks for the chance to win! I’m a kid at heart (walked all around Disneyland with my Mickey Mouse ears on for my 50th birthday…everyone seemed to get a huge kick out of that!) and would love to see Legoland. And I’ve never been to SeaWorld. This would be the perfect chance! I’m from Minnesota and missing the snow, too. People think I’m crazy so I’m glad to know I’m not the only one! What a fun memory building a Lego snowman would be! We just moved to the area and my kids would LOVE the chance to visit these fun places! What a fun winter activity! Thanks! Have not been able to take my 2yr old to Lego Land or Sea life yet due to being laid off and this would be a heaven sent and what an experience! My kids are soooo excited to go to Sea World to see baby sea turtles and pet a dolphin. They have never been there (we live in WI) and ask every week how much longer before we go (we are going in July and they’ve known this for a couple of months)! The kids love LEGOland at Mall of America and would go crazy at a whole LEGO themepark. See you in July San Diego!!! I would LOVE more than anything to go to Legoland! Legos were one of the fondest memories of my childhood and I would love to pass that on to my family. Plus, what could be better than Legos + aquatic life!? That’s how we roll in San Diego! Congratulations Jessi C.! You’ve won four (4) SEALIFE Hopper Passes! Have a happy holidays! I would love to visit San Diego again!! Spent last Christmas there with my son and his wife. The temperature was great but no snow. My 4 year old loves the snow!! How fun would it be to take her to play in the snow and get to go on some of her favorate rides. My littlest has never seen snow! I’m from Brazil and have been here in San Diego for four months now. And the only thing that I could complain about this city is that we can’t have snow (like in my country). Definitely it would change my mind, hehe. Would LOVE to take our 4 year old to Legoland!!! I love San Diego and love the snow… just don’t like the wet, coldness that comes with it. I’d love these tickets and would take my husband, nephew, and neice along. I love san diego! Cant wait to be back there in 10 days!! !